This Limited Edition art book has been in the making since year 2010. This delay was caused by distracting circumstances, that turned out to be also very destructive. As a result, one of my cherished pieces I was working on, titled “Veritas Omnia Vincit”, that I planned to be prominently fe atured in this book, was accidentally damaged while still in clay. The long months of work on the 5 foot sculpture, is that portrayed and enthusiastic figure, full of joy, with arms victoriousy stretch towards the sky, will be a cherished experience. It will not be featured in this book evening clay …. But this unfinished work was a part of the reason not to postpone the publication of the book any longer. Somehow it prompted me to act. This book is about art expressions. My personal expressions as an Artist , are revolving around two things – philosophical search for an inner freedom and the human emotional search for self- definition. Partial answers to my questions have been heavy emerged in the process………without a love for our world, dream for the future of humanity and our planet, there is no truthfully existence, no truthful self-definition…. It all starts with inspiration. It all starts with a dream, followed by love, clad any determination. I invite you, the art lover and aren’t viewer, to indulge in your very own emotional discovery and ultimately become a part of my search for answers. The book encompasses a period of my work for about 15 years. The Art Book signing event is scheduled for May 9, 2018 from 4 to 7 pm in the City of Calabasas. This event is by invitation – however , feel free to RSVP to attend! The Library doors will be open! Look for your Invite in the e-mail and /or mail! We will be displaying some of the bronze sculpture portraits as well as a small number of the large scale paintings, in addition to the two dozen short art videos created through the years. . We’re looking forward to creating a beautiful event that will complete a 15 year period, devoted to portrait sculpture with and expressionistic large scale portrait paintings and abstracts , in order to open the road to my new artistic journey of contemporary and conceptual geometry. There will be light refreshments and all around good vibes served. See you then! PS. For those of you who couldn’t make it – this is the Amazon link to view and purchase the book. Thank you! This gallery’s artist roster highlights the works of emerging and mid-career artists with a keen eye for the pulse of contemporary society. Whether through vibrant color, social commentary, or innovative structural techniques, these artists offer thought-provoking imagery across a variety of media. It has been a true and rewarding surprise! I was very enthusiastic to see what is in show – some of the invitations were informative I was actually looking to an Art Talk at Samuel Freeman Gallery , just to find out that they have moved and I simply have forgotten… Ugh. One thing didn’t make me happy – the SANTA MONICA MUSEUM OF ART has closed its doors….. This was a sad moment – but I am sure it will be resolved in matter of months. I have been there a few times – and ever since it opened – it looked more like a gallery. Perhaps because my idea of an Art Museum as institutions like MOCA or LACMA or TATE …. Anyway – regardless of what I thought – it was a great start for a future institution. Arts have in disfavor f lately by lawmakers and budgetmakers , cutting art programs from schools – so any organization that enhances public ‘s interest in Art is good. Santa Monica Museum of Art , despite its small size was a plus…It remains to be seen what the fate of this art establishment will be. The truth is– most of the shows were good, some of the shows were even fantastic ! ANDREW WEISS GALLERY, located in the place of the James Gray gallery had a great opening of small works on paper by Larry Bell and Ed Moses among others. It had the feel of a San Francisco gallery… GREG KRULL GALLERY had works by Ned Evans, RUTH BACHOFNER Gallery was showing Virginia Katz and Audra Weasner, LOIS LAMBERT had Kinetic Art and LAURA KORMAN has Katherine Tsu Lynn Mann. All galleries were curated and staged to perfection this season. .Some of them displaying quite a classy presentation with a performance by classical harpist( Charissa Barger at Laura Korman) . The effort extended past the Art and contributed to an air of a celebrartory feel. Hopefully this will reflect in the sales. Bergamont Station is making a come back! !Public’s interest in Art is making a come back! This is the best news as of lately. Yes! Finally! Thank you LA! Two days ago I was checking my FineArt America newsletter and I came across an interesting topic, that stemmed from a popular blog by a prolific and super talented Graphic Designer Milton Glaser. He is the creator of more than 300 posters for clients in the areas of publishing, music, theater, film, institutional and civic enterprise, as well as those for commercial products and services. In the Article that I read – that actually was a talk he has given quite a while ago – Mr. Glaser touches interesting subjects that no one talks about. The everyday search for work, the effort to preserve integrity despite the pressure to earn income, the everlasting pull-push relationship between Client – Consumer – Designer. Mr. Glaser is a graphic designer. However – his insights are equally valid – probably even more so for Artists. I know – some Artists are looking down on Designers – for some inexplicable reason. How I know? I am a Designer. Has been one for all my life. But I am also an Artist . A good one too. Ultimately I am hybrid of the two. Where does the Designer end and the Artist begin? I wondered many times. Once of my Facebook connections – I saw a comment about a Designer – by a novice Artist saying: “…. He is just a trained technician – that is what designers do …” I laughed out loud. I could no believe that someone could be so narrow-minded. This made me think. What is the difference between Artists and Designers? And where is the fine line between the two – if in fact it does exist? Here is my view on this . Designers are Artists, who learn how to harness their talent and skills to the specific need of a market of a Client, who use their creativity to produce an great amount of designs. Their final result is measured by the reaction of the Client and /or their Public – and in that sense it might be geared to a specific extroverted effect. Designs can be groundbreaking, innovative, uplifting, flattering, complimentary…. Designers seldom stand and admire their own work…. They are already on the next project…. While Art is more intuitive, introspective, meditative and philosophical . Artists vision is unharnessed by their Clients wishes – rather, they are expected to provide their own criteria and aesthetic value. Designers act like aesthetic agents for their clients while Artists possess an aesthetic nucleus, which is a reflection of their own perspective on life. Their Collectors ( Clients) follow. In general, however – Artists can learn a lot more from Designers. Designer work requires more discipline – freedom is conditional. Yet – in essence – the two professions blend in a way that leaves us asking for more. It is not an accident that the best projects in Public Art are a result of the successful amalgam of Design (Landscape Architecture) and Art or Sculpture and architecture or poster designs and contemporary painting. And if anyone wants to dig deeper through the centuries – they can go as far back as Gian Lorenzo Bernini – or his successor Michelangelo. They were both Sculptors and architectural designers. I suppose these titans of art were the harbingers of interdisciplinary practice of blending design and art seamlessly. 1.YOU CAN ONLY WORK FOR PEOPLE THAT YOU LIKE. 2.IF YOU HAVE A CHOICE NEVER HAVE A JOB. 2.SOME PEOPLE ARE TOXIC AVOID THEM. 4.PROFESSIONALISM IS NOT ENOUGH or THE GOOD IS THE ENEMY OF THE GREAT. 5.LESS IS NOT NECESSARILY MORE. To learn more about this prolific and wise artist , please visit his website MiltonGlaser.com. The design Company is located in NY, if anyone is interested to subscribe for their newsletter visit their website. Milton Glaser, Inc. 207 East 32nd Street, New York, NY 10016 T: 212-889-3161 F: 212-213-4072 studio@miltonglaser.com. At last! It has been quite a few years since I have started planning the publication of this book. Planned as a monograph – with some insights and personal experiences surrounding the creation of each work – along with high quality photography by Kelsey McNeal- this book is long overdue. It marks symbolically my formal entering into the sphere of multidisciplinary blend of contemporary public art and landscape, art and architecture. 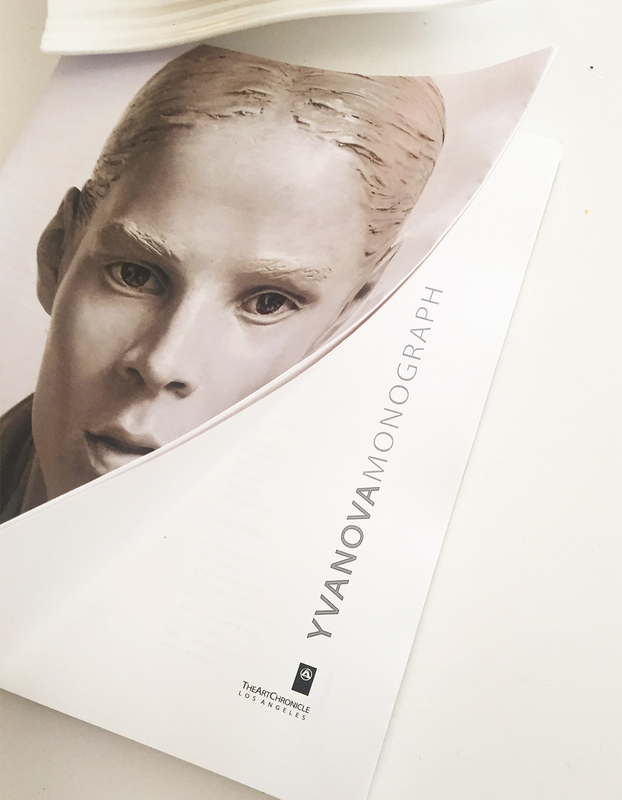 The book is a crowning completion of a decade devoted to figurative sculpture, portraiture and large scale abstract painting. The format is large – 11 by 11 inches, hardcover with a dust jacket. It is the first of a possible series published by The ArtChronicle. A few other California Artists/Sculptors are already been selected for this art book series. Publishing is planned by high quality printing company MIRA Publishing in in Missouri. As soon as the final touches are added – and the newest sculpture titled ICON is finished and photographed – it is ready! Indiegogo campaign is in storeandthe rewards are amazing in their value! Please stay tuned for the INDOEGOGO fundraising campaign, which will feature exciting gifts , from signed posters , unique and stylish experiences like tickets for a concert and/or diner for two at well known places in Beverly Hills and similar exclusive locataions to sculptures, especially remastered for the occasion. Stay tuned! Exciting news ahead! I have discovered Cliff Garten’s work in 2013, during my routine research about Harvard graduates of the Graduate School of Design. I was very inspired by what I saw – the scope of his work , the depth, the scale and the playful creativity, all while encompassing large projects with infrasctucture connotation. I was attracted and inspired by the “Bullet & Suspect” composition imagery. Despite the harshness of the theme –since the project is a Forensic lab in Denver – and the hard durable materials – the poetry of the composition is undeniable. This is very similar to the well balanced wave design of the Los Angeles Overpass – the Baldwin Hills gateway, strongly reminiscent of e lace ribbon. There is a continuity in Cliff Garten’s work – that is rooted in his inner equilibrium. I was inspired by this giant visionary, who breaks boundaries and makes a statement – with harmony and without antagonizing the environment and the public. Cliff Garten’s clear interest and in the connection between the Public and Private realm as it relates to Art , has always been close to my heart. Mr.Garten artistically embodies my inner belief system in that field. It is not incidental that my own artistic expression covers a wide range of medium, that can only be categorized as “multimedia “. That multidisciplinary quality was another one of Cliff Garden, that I deeply relate to. Somehow through the years – I always believed that Art and Architecture are closely related and the tangent is called Landscape Architecture. Apparently the Harvard School of Design shares that view, since the graduate Public Art program and the graduate Landscape Architecture program belong to the same school. 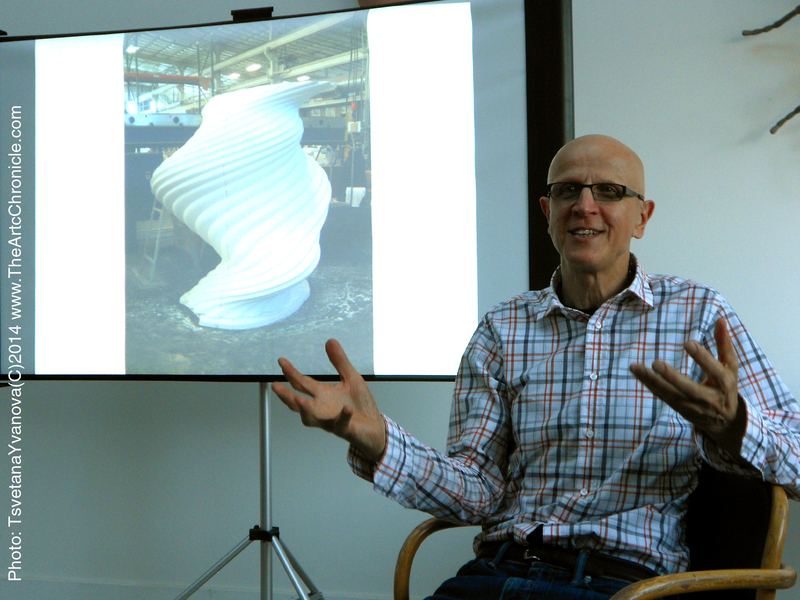 On May 12th, 2013, the Los Angeles Arts Commission launched a new program of Open Studio talks with Artists – I was excited to attend to the Cliff Garten’s Open Studio. I was one of approximately twenty attendants. It was a great pleasure to meet Mr.Garten in person – for his level of sophistication, he is an approachable, kind mannered tall man. The presentation was a revelation of his noteworthy projects, his approach and his methodology. There is hardly enough space to point out the details of the presentation- what was clear was that the success of the Studio is lined with depth , dedication and careful planning. Cliff Garten Studio . is a multidisciplinary Art studio for Public Art with the structure, discipline and organization of an Architectural studio, incorporating digital technology along with hands on craft. As Mr.Garten said – “You simply cannot buy a software and become a great designer because of it. The software is a tool – just like the brush and the sculpture rake.” You cannot design something that you are unable to craft with your own hands…” Excellent point. Artists vision for the concept comes first, dictated by the site and or the location – everything else follows, including the digital craft. To say that I agree is an understatement – I share this opinion 100%. I am very enthusiastic about the rest of the Artists open studio events . Despite the facts that I have attended the most interesting and most inspiring Art talk. Why ? Perhaps because this new form of Art, the so called Public Art is a relatively new phenomenon and is born in the Unites States. And perhaps because it is the only form of Art, that has the capacity to transform the infrastructure of the public realm in this beautiful vast country of ours. Because America might be beautiful – when it comes to nature – but with the demographic expansion comes building an construction expansion that takes over and it is very easy to turn a green field into a concrete desert. 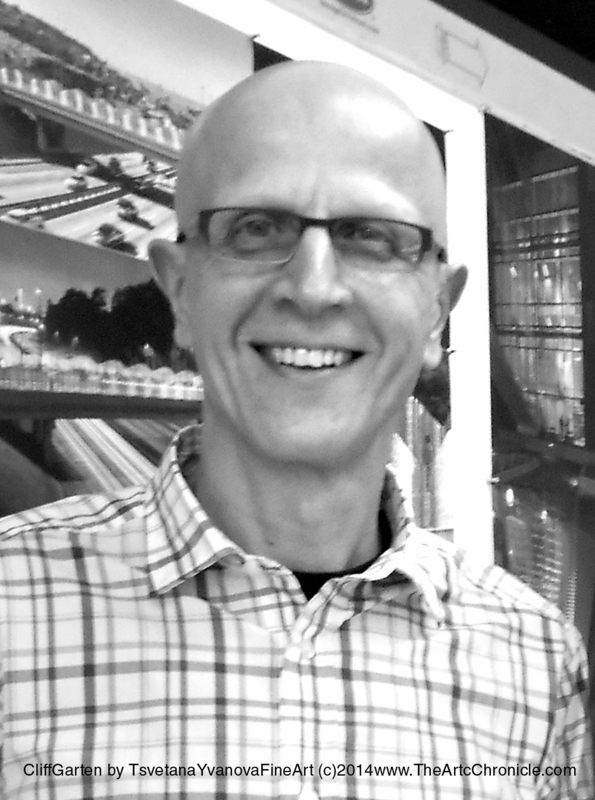 Cliff Garten’s vision has made vast breakthroughs in that regard – by showing that Public Infrastructure can be harmonious and functional at the same time. It is what people call beautiful. I call it simply brilliant. If there is any slippery slope between Art and Function – it was not present in Cliff’s Garten’s work. When it comes to Public Art – Form and Function is allowed as long as it does carry artistic vision of a genius like Cliff Garten to unite the two in a interplay that brings subtle , yet unforgettable experiences. Dear Friends, it has been a while… forgive my inconsistency! While the desire to write about artistic events and work that interest me is as usual boundless – time seems to be the only limitation. However – for those of you who enjoy these writings, that come from the heart of my love for Art , I am restarting my writing with this post– about a Bulgarian artist, whose work has crossed boundaries. I have always wanted to devote special posts to my Facebook ‘discoveries’. Some of these Artists are unbelievable. Susanne Kessler ( a sophisticated installation Artist from Germany ), Philip Geist, Ross Ashton ( brilliant Multimedia artists from Germany and Great Britain ) , Cliff Garten ( a California Public Artist with incredible visions) to name a few. These artists have something in common – they are absolutely brilliant! And inspirational! As I promised in the beginning – I only show you artists who have in some way astounded me and inspired me. That is a promise I will keep! So before I resort to presenting each an every one of them in time, allow me to present you a very talented and masterful BOGDAN ALEXANDROV, whose latest work, that was exhibited in Yuzina Gallery(2013) – I also encountered on Facebook. The genuineness of his vision is undisputed. His latest exhibition in Sofia has created quite a sensation. It id here – on the West coast by means of digital media. The large canvases by Bogdan Alexandrov convey a certain mood, that seems to captivate the viewer and leave a lasting impression. And makes us think. Makes us relate to the people in the images. ” What are they thinking? What are they talking about…? “After these questions fade away , we discover that it does not really matter. What matters is – that these paintings have captured a moment in time – that will never happen again. The eternal ‘now” as the Zen philosophy points it. The only moment that actually exists. Bogdan Aleksandrov, Born in 1960, Vidin, Bulgaria. M.A. in Fine Art Painting.Lives and works in Vidin, Bulgaria. 2012 “Purgatorium”, Rayko Aleksiev gallery, Sofia, BG. Curator Desislava Moneva. 2012 “Creation from nothing”, St. st. Cyril and Methodius University Veliko Turnovo, BG. Curator Georghi Minchev. 2012 “Local cooling”, Gallery L’Union, Plovdiv, (BG), painting. 2010 “Panta rei”, painting, Novi Sad, Serbia. 2010 “Noise”, Sofia City Gallery, Sofia,(BG), painting, sound installation. 2008 “mixed”, Art Alley Gallery, Sofia, (BG), digital print, painting, video,drawings. 2007 “Initial E”, Gallery L’Union, Plovdiv, (BG), Video installation, work on handmade Japanese paper. EXCLUSIVE ART SALE – ONLY 60 DAYS! 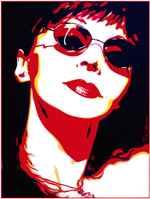 The Principal of The Art Chronicle, Tsvetana Yvanova, is an active and multifaceted Artist, Sculptor, and a Designer. The Bulgarian born artist has studied Fine Art with Prof. Angelakov of the Art Academy "Nickoloay Pavlovich", while she earned her Masters degree in Landscape Architecture. Attending the accredited MBA program at Graziadio School of Business, Pepperdine University has had a profound effect on her understanding the dynamics of art and business. Influences like Christo, Franz Klein, Andy Warhol and Architects John Lautner and Tadao Ando, have left their mark on the aesthetic credo of Tsvetana as an artist. Since 2005, Tsvetana Yvanova's work was presented in four individual exhibitions throughout California. 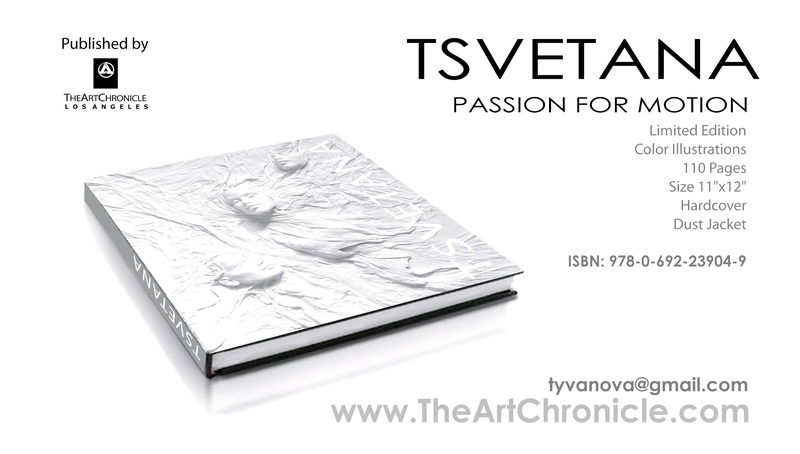 The Art Chronicle is an online publication of Tsvetana Yvanova Fine Art.